SAN FRANCISCO, CA--(Marketwired - Apr 22, 2015) - Tiger and Dylan, two environmentally conscious Silicon Valley high school students, have chosen Earth Day 2015 to launch a "non-fundraising" IndieGoGo Campaign, ameGLOBE - Tiger & Dylan X Save Our Globe, to help further ignite the growing international movement to bring awareness to global issues and foster community to help preserve the planet. 1. 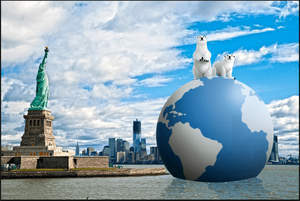 Endangered GLOBE World Tour - Encourage the Mayors of major U.S. and International cities -- San Francisco, New York, Shanghai and particularly, Paris during the 2015 UN Climate Change Conference in December -- to be at the forefront of environmental innovation and politics by positioning the 120' mega globe (pictured above) in their cities to draw attention to environmental issues. 2. Distribute 422 Bike Stations with 4,220 bikes worldwide - Encourage volunteers, partnerships and, if need be, capital to place 422 multi-bike stations across the world for people to use instead of automobiles and other CO2 emitting vehicles. 3. The Eco-Bike Challenge - Challenge people -- from parents to CEOs to celebrities -- to rise to the challenge and pick a day to use a bike as their main mode of transportation. Post a video or photo on social media using the hashtag #GlobeSavers2015 and invite three more people to do the same. The three celebrities they are most keen to recruit -- and most admire -- are President Obama, Presidential Candidate Hillary Clinton and Apple CEO Tim Cook, all of whom participated with last year's UN Climate Summit. Join the movement, visit IndieGoGo (ameGLOBE - Tiger & Dylan X Save Our Globe). Together, we can make a difference. Tiger and Dylan want to build a community of globally conscious people. They want to shift the collective perspective to become mindful of the environment. They know that movements create great change, and they are rallying to create one for our planet. "We hope to inspire a quantifiable impact, and the greater number of people that participate in the Eco-Bike Challenge and see the 120' Globe in our cities, the greater number of people to potentially experience a positive shift in perspective towards our earth," said Traub. Two San Francisco high school students, Tiger and Dylan, care about the future of their planet. They remain anonymous at the request of their parents. David Traub is a recently converted environmentalist, with a movie in development addressing our rising sea levels. David has 30 years of experience as a digital media-oriented executive producer, entrepreneur, investor, venture catalyst, global business development executive, and/or board member to over 40 startups companies. David has created content as a co-founder, executive and/or executive producer of digital products for a wide variety of clients such as EMI North America, MCA Records, Philips/Polydor, Microsoft/ MSN, Apple Computer and many others. His most recent feature film as executive producer was JOBS, starring Ashton Kutcher. He graduated from UC Berkeley and received his Master of Education from Harvard University. AME stands for "A Mobile Ecology."